The opening pair of KL Rahul and Murali Vijay frustrated the Australian bowling unit. CHENNAI : Australia have not chased 200 or more to win a Test at Adelaide since 1902. And India already have a lead of 166 runs with seven wickets in hand. This should, in many ways, tell the story of where the Adelaide Test is heading. And then there is the small matter of the pitch which is helping the spinners. Given how the Australian top-order struggled against Ravichandran Ashwin in the first innings, India will be more than fancying their chances of taking a 1-0 lead in the series before they depart for Perth. After two days of gripping cricket, Day 3 was dominated by the visitors. With a slender lead of 16 runs, a lot depended on how the Indian batting would respond in their second essay. And unlike the first morning, KL Rahul and Murali Vijay were cautious enough not to hand the advantage back to the hosts. With rain delaying the start of India’s innings, the overcast conditions presented the hosts a chance to get back in the contest. If Vijay was confident at the start, Rahul struggled to put bat on ball. But, all of it would change in a while. With his cautious approach not yielding much, Rahul went for shots. An inside-out loft of Josh Hazlewood turned into a confidence booster as a couple of overs later, he launched Pat Cummins over the cover-boundary and followed it up with a gorgeous cover-drive. Though Vijay remained muted, this was the duo’s first 50-plus stand in away Tests. Though Mitchell Starc came back to the attack to take care of Vijay, Rahul, showing signs of a return to form, looked firm before playing a loose shot of Hazlewood. At 80/2, India needed Cheteshwar Pujara and Virat Kohli to step up. The situation demanded nothing but a steady partnership, which the two did with a 71-run stand for the third wicket. That dented any hopes of Australia running through the middle-order. If Kohli abandoned flamboyance for more control, Pujara was carrying on from where he left off in the first innings. Though Kohli was largely untroubled, Pujara survived twice, thanks to DRS. First up, he was given caught-behind off Lyon, which was overturned. Then a little later, he was adjudged LBW after not offering a shot to the off-spinner. Pujara went for the review and hawkeye showed the ball was going over the stumps. Barring these two instances, Pujara showed no signs of throwing away his wicket and although he lost Kohli towards the end, he looked firmly in control. India will be hoping for more of the same from him on Day 4. With Lyon gaining plenty of bounce from the rough, Ashwin will have a prominent role to play in the fourth innings and pacer Jasprit Bumrah, who picked three wickets in the first innings, expected India to consolidate their position on Sunday. “I think it is slightly in our favour. The late wicket (Kohli) was a good thing for them. But we have a good lead. First session tomorrow will be very important. If we capitalize on that, it will leave us in a very good place in this match. Pujara has shown a lot of patience and that is the key element in Test cricket. He knows his game in and out, and he knows his strengths. He is playing around that strength,” he said. Australia 1st innings (overnight 191-7): Head c Pant b Shami 72, Starc c Pant b Bumrah 15, Lyon (not out) 24, Hazlewood c Pant b Shami 0, Extras (lb10, b6, nb2, w1) 19. Total: (all out; 98.4 ovs) 235. Fall of Wickets: 7-177, 8-204, 9-235. Bowling: Ishant 20-6-47-2, Bumrah 24-9-47-3, Shami 16.4-6-58-2, Ashwin 34-9-57-3, Vijay 4-1-10-0. 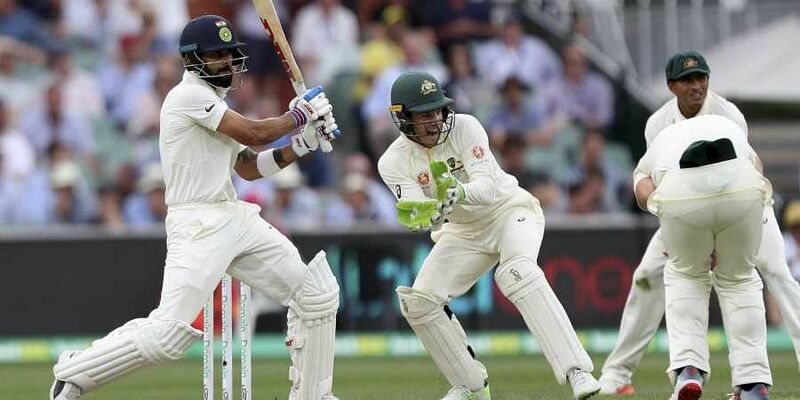 India (2nd innings): Rahul c Paine b Hazlewood 44, Vijay c Handscomb b Starc 18, Pujara (batting) 40, Kohli c Finch b Lyon 34, Rahane (batting) 1, Extras (b2, lb12) 14. Total (three wickets; 61 ovs) 151. Fall of Wickets: 1-63, 2-76, 3-147. Bowling: Starc 10-3-18-1, Hazlewood 16-9-25-1, Cummins 11-4-33-0, Lyon 22-3-48-1, Head 2-0-13-0.